There is no better way to explore and experience the African bush than on foot. For the safari purist, walking safaris provide a much more rewarding and spiritual experience than traditional game drives. To view the bush from a vehicle makes you a mere observer but to get out on terra firma you become part of it. Walks typically last two to four hours, under the guidance of at least two professional guides and game scouts in most areas where dangerous big game such as elephant, lion and buffalo may be encountered. We also arrange multi-day and multi-camp walking safaris where the distance between each camp can be covered in three to five hours depending upon the flora and fauna along the way. When you arrive at the next camp your luggage will be in your room. Some guests prefer to walk part of the way then rest their legs and game drive the remainder. Most of the our destinations offer walking safaris, particularly at private concessions and game reserves or conservancies outside national parks. The set up and formats of bush walks vary considerably between countries, reserves and individual safari camps. We work with many of the continent’s best walking safari guides. 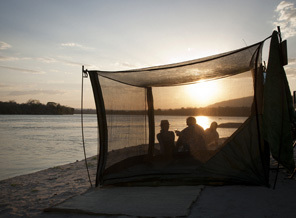 The Luangwa Valley is the home of the walking safari and is the gold standard for walking safaris in Africa. All walking safaris in Zambia are led by an armed wildlife ranger or scout and he is followed by a professional safari guide. The idea of having two fully trained experts at the head of each walk was conceived by our partner in South Luangwa, Norman Carr Safaris, and has been tried and tested for decades with an unparalleled safety record and is believed to be the safest way to conduct a walking safari. Over many decades this way of walking has proved extremely safe both for guests – and equally importantly, the wildlife. Children under 12 years old are generally not allowed on walking safaris but there is no upper age limit and one does not need a high level of fitness as walks are conducted at a slow pace.